Sea Kayakers around Sydney are getting tougher or the clothing is getting better. 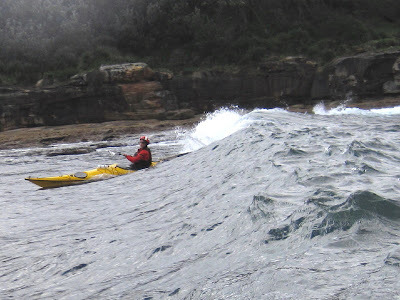 Just last week I had an 8.00am rolling lesson with air temp at 7deg C and water temp 19deg C; and the Tuesday night paddling contingent continue to stop for a few deep water rolls in the inky dark waters off the cliffs of Sydney and Botany Bay. 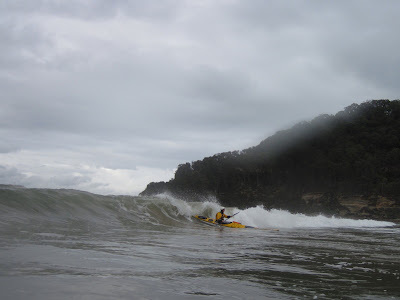 Warm water and cold air are a great combination for Autumn/Winter surf training; the cold air keeps the swimmers away and the warm water reduces that slap in the face feeling when punching out. 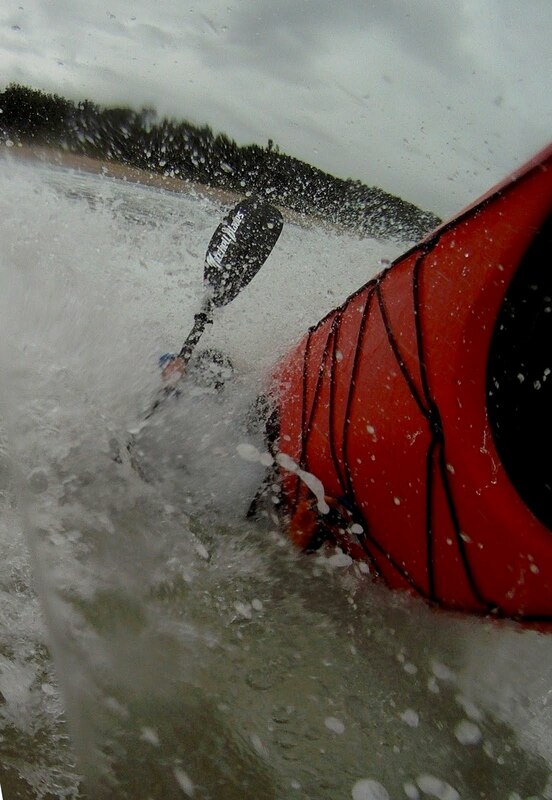 The lack of competition for small surf gives sea kayakers a chance to stretch out a bit. With a clear and wide line to the beach I snapped the self portrait above practising reverse endos at lunchtime at a surf training day. Why is it whenever I pull this stunt everyone is looking the other way? 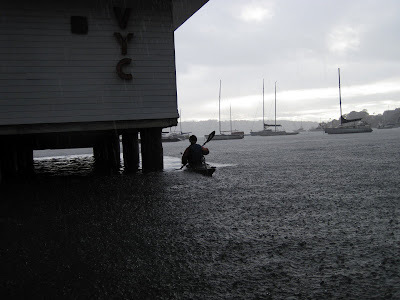 This shot of Neil was taken the same day using a one handed low brace with camera in the other hand. A couple of resilient Kiwis in OZ just to test boats. "We never get weather like this back home." the waterways that make up my "office"
Sharon leads the way around Point Perpendicular, The Beecroft Peninsula. On my day off from kayaking commercially I often find myself drawn to this part of the coast and when I get there I cant resist going for a paddle. 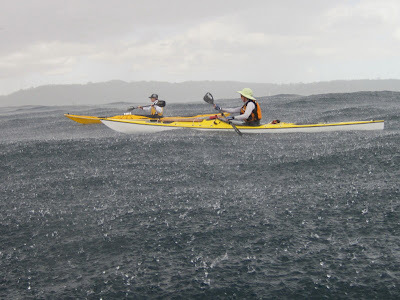 Sharon's Saturday morning paddle, rain hail or shine. 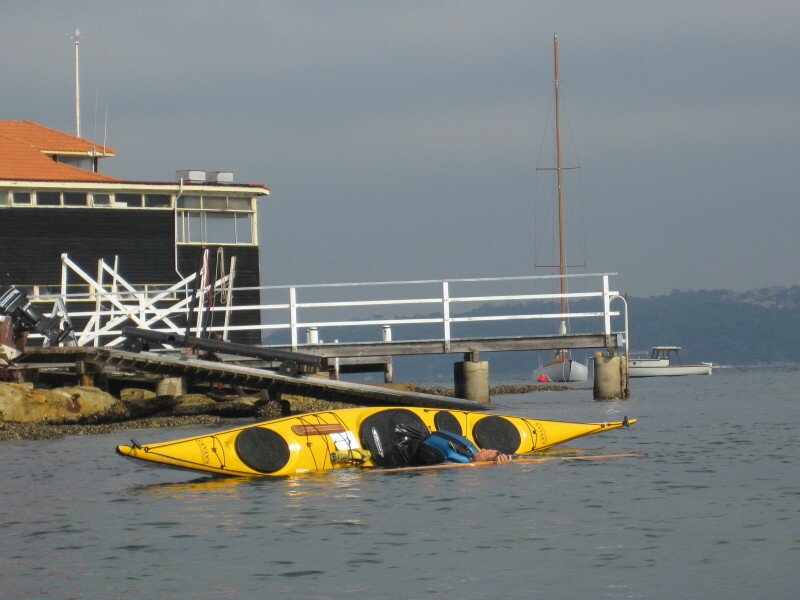 This paddle has become a regular fixture for Sydney kayakers. 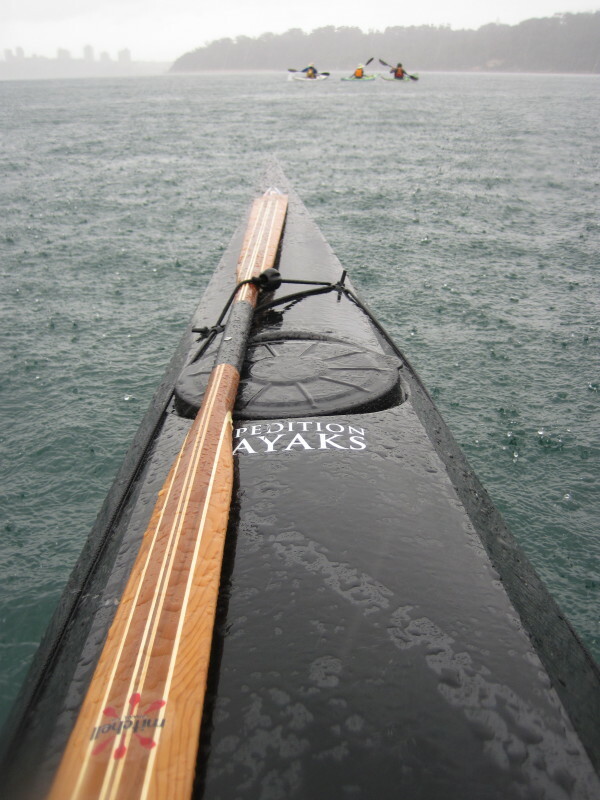 I think the success of this paddle lies in the simple formula of regular exercise, supportive environment, friendly crew and fresh coffee. 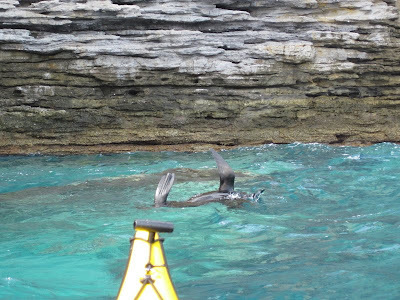 Seals are where you find them, and this one was happy to stay put regardless of interlopers in kayaks. The cool conditions have brought a number of these Southern visitors up to the city for winter. Around Sydney the urban paddler can expect to see more dolphins, whales, seals, sharks, fish and seabirds than ever before, there is even a couple of turtles if you know where to look. To find a time of more abundance in the waters around Sydney would probably predate our use of sea kayaks in the area. Maybe the seasonal visitors of my childhood including, hairtail and slimy mackerel will return in due course. Rae about to be engulfed in the soup. 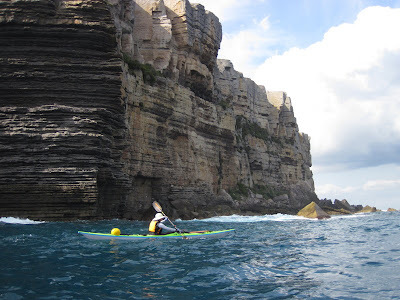 Another fun day with a small group and gentle waves on the Central Coast. 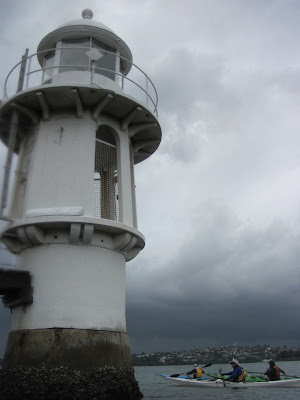 Colour photo of a monochromatic day. Paul demonstrates some of his Greenland skills. 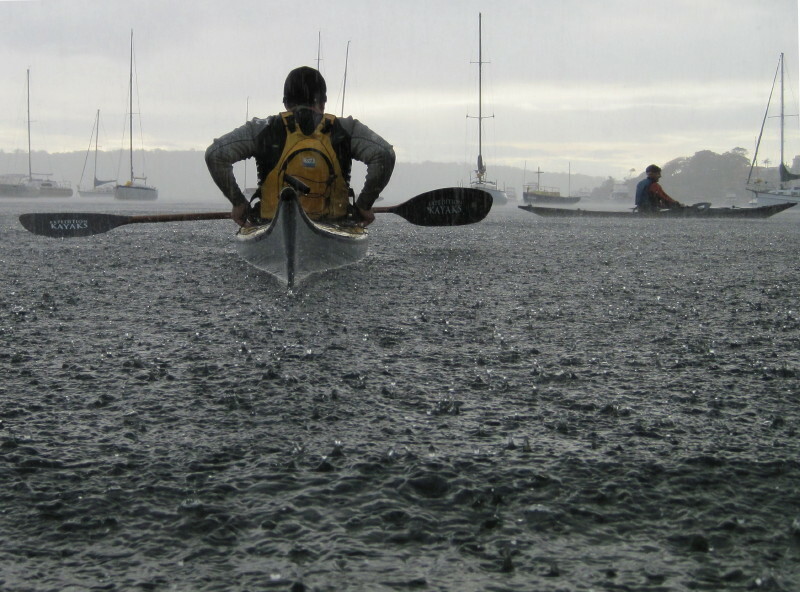 This is a growing niche with more and more paddlers enjoying the physical and technical challenges of traditional techniques. 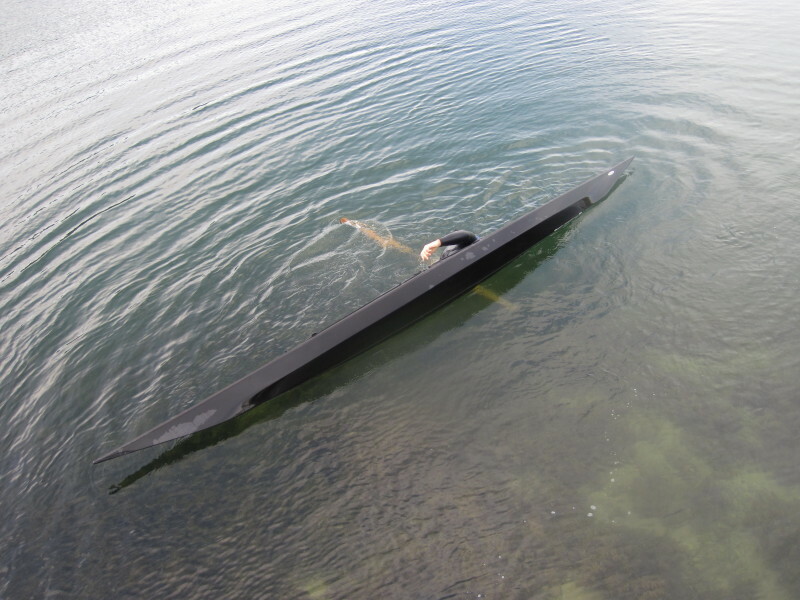 The low volume Greenland style boats are great for getting the feel for these skills. 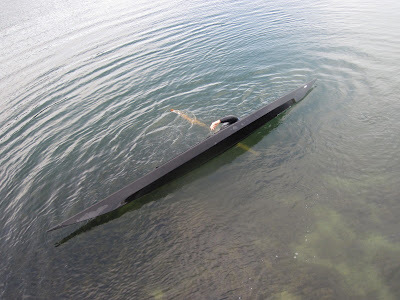 The boat and the paddle: just add water - If rolling is on the agenda these are the right tools for the job. 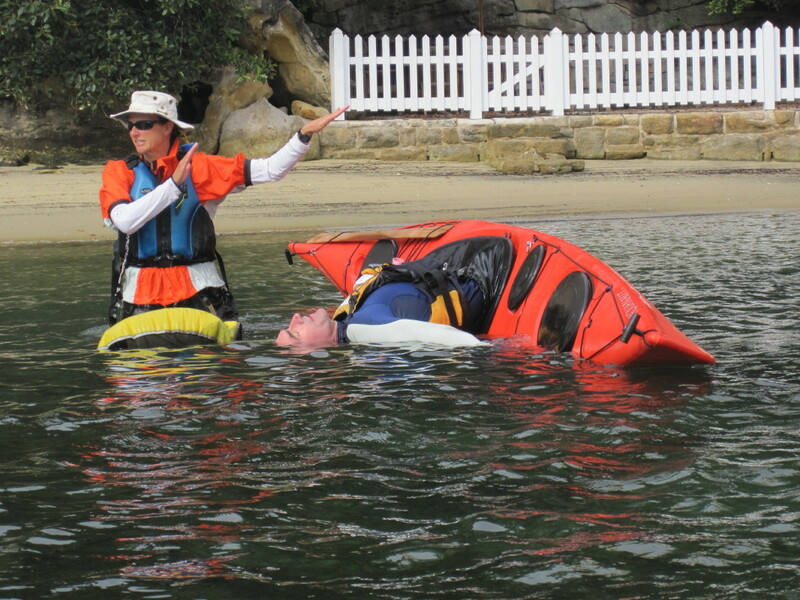 No, this isn't world renowned kayak instructor Ginni Callahan directing traffic while Ian takes a nap. Ginni shows how it is done. Her flexibility and finesse were inspiring. Although her visit coincided with the end of the really warm weather many of us have persevered through the cooler months so I am expecting there will be some noticeable improvements in the gentle art of Greenland rolling by the end of this summer. 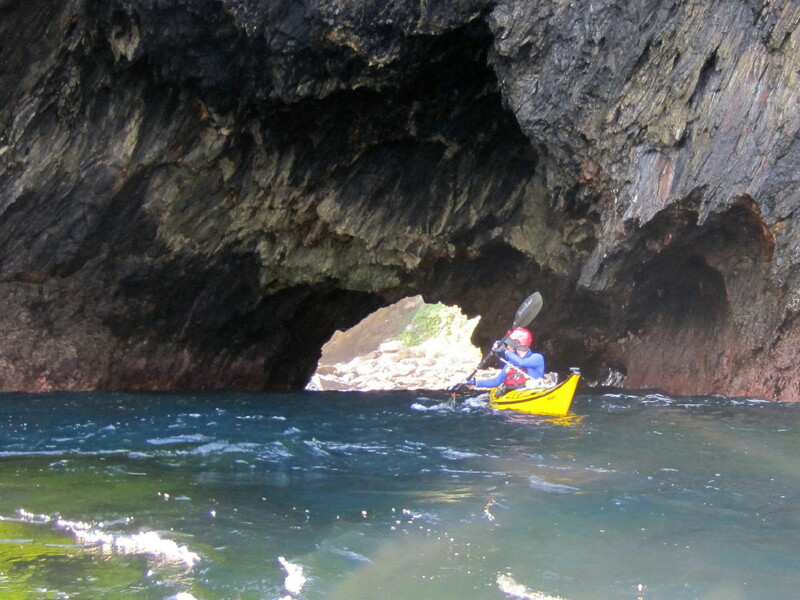 Gina backs into a sea cave off the Toll Gate Islands. With the occasional bigger set coming through backing in was a good strategy. As with many rocky play spots, good control forwards, backwards and sideways make the whole activity safer and more fun. Sometimes your forward stroke is your best defence. Gina running a tight gap off Gorilla Bay, South Coast, NSW. This is Danny Blackwell heading out with the Tuesday night group for one last paddle before heading off to Africa to paddle across Lake Victoria with a couple of his mates. Since this photo was taken the trip has been successfully completed. Well done Danny. 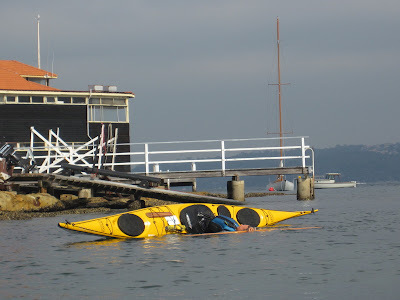 A big adventure to raise money for a very worthwhile charity. 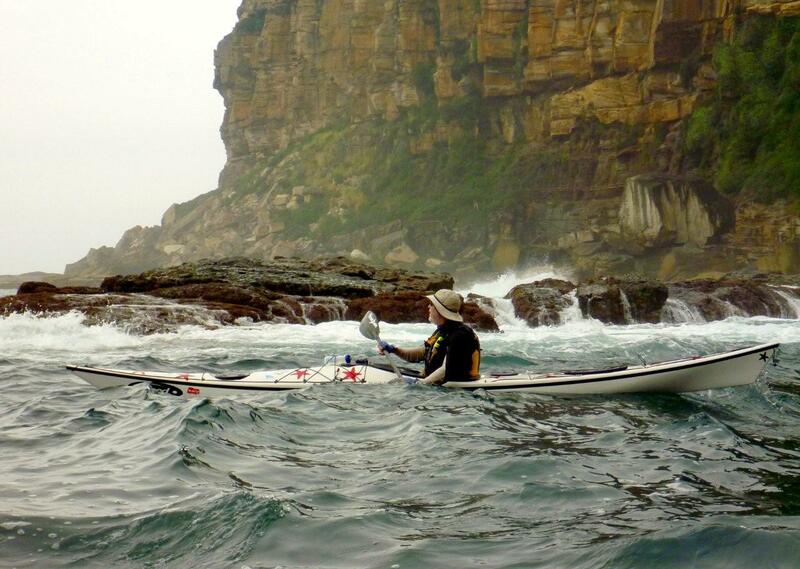 Part of Sharon's Saturday group off Bradley's Head. The historic lighthouse marks the big left turn that all shipping has to make after on its way to Sydney Heads from port facilities further up stream. 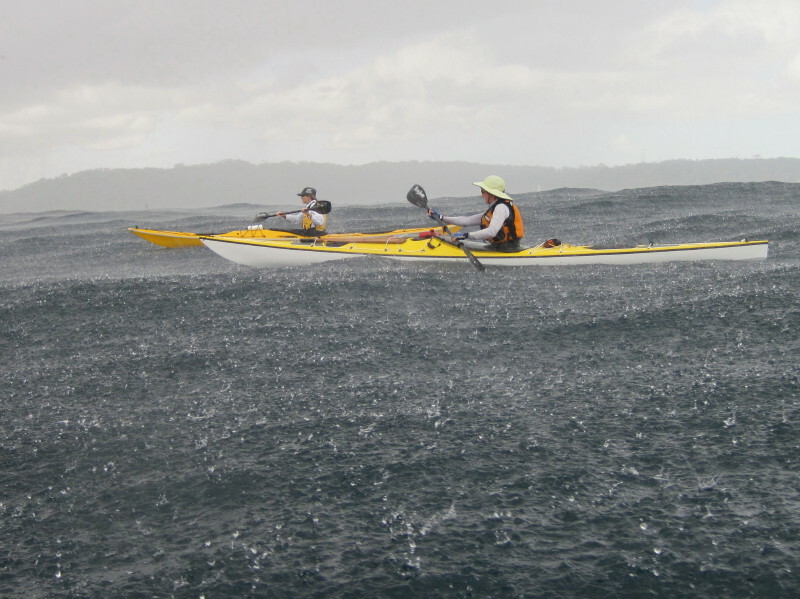 Kayakers get one last look for heavy traffic before heading North towards the outer Harbour. 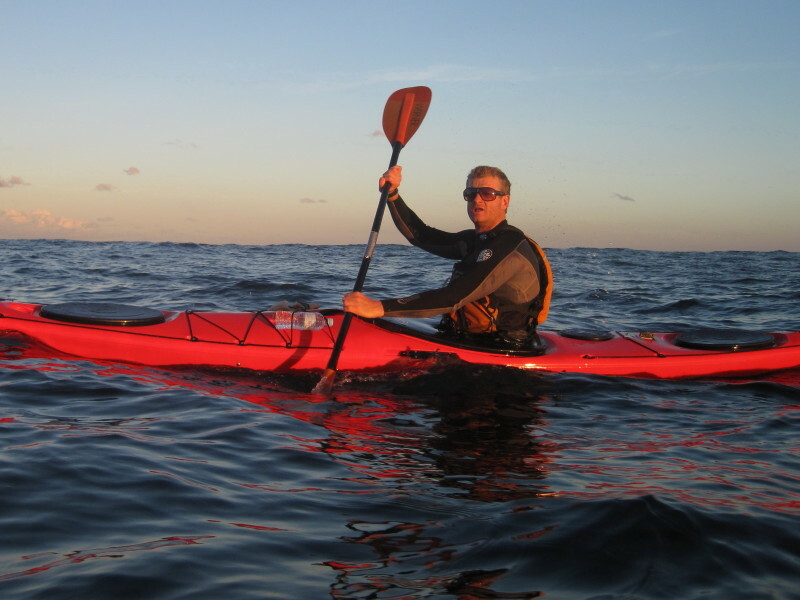 Days are finally getting longer again and the city skyline is often still illuminated by the afternoon sun as we leave for our evening paddle. 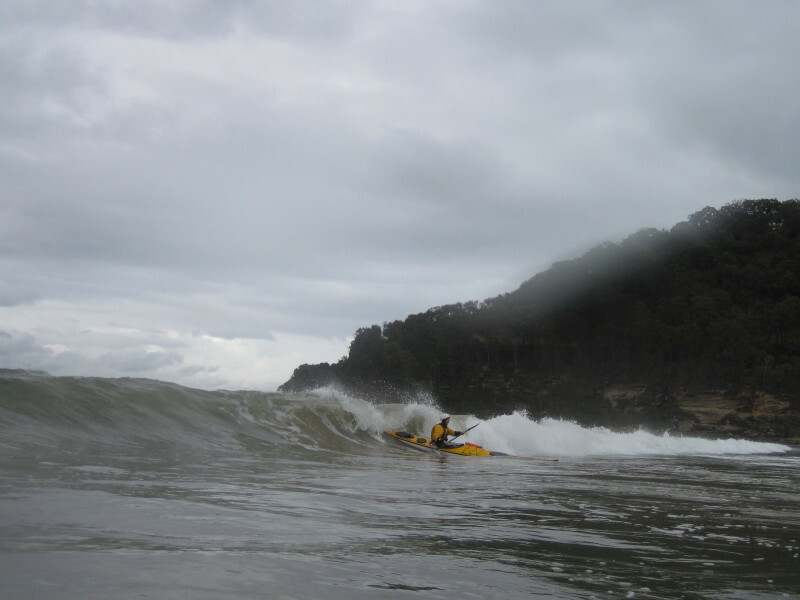 The winter southerlies have provided some great opportunities for getting out in the breeze, riding the waves and practising skills in open and moving water. 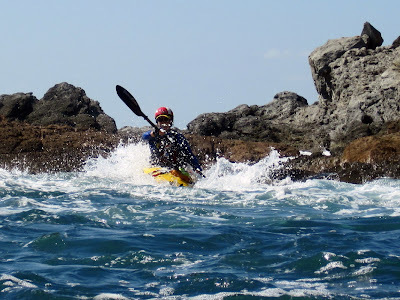 As local paddlers get more skilled and keener to advance they are realising that Sea Kayaking can be year round sport and there is no need to lose all that hard earned paddle fitness and skills just waiting around for summer. 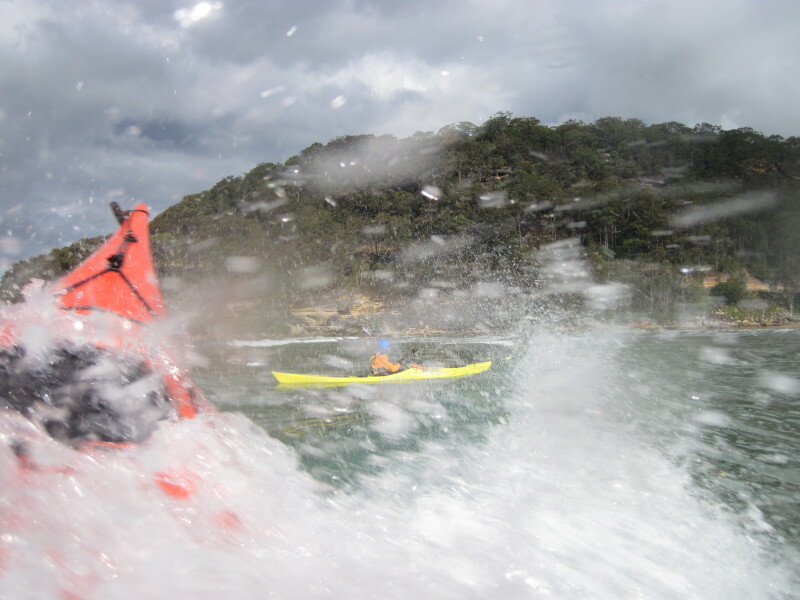 Lively Conditions Off Sydney Cliffs. Northern Epic - They made it.